Dutch champions Ajax say Tottenham have contacted them about the availability of coach Frank de Boer. A spokesman for the Amsterdam club told BBC Sport that Spurs approached their director of football Marc Overmars by telephone within the past month. 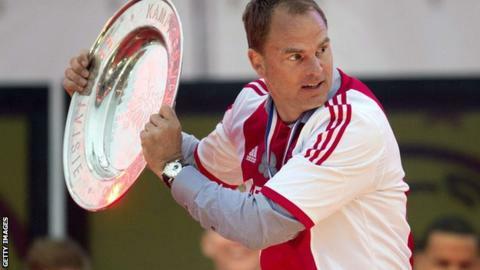 De Boer, 43, has won the Dutch title with Ajax in each of his four years as a manager. Tottenham declined to comment but will review manager Tim Sherwood's progress at the end of the season. Sherwood succeeded Andre Villas-Boas in December and is under contract until the end of the 2014-15 campaign. On Sunday, De Boer led Ajax to a fourth consecutive title since he took over in 2010 and a 33rd in their history. The former Ajax and Netherlands defender is the first manager in the Eredivisie to win four straight championships. He signed a new deal last May to remain in charge of Ajax until 2017. In an interview with national broadcaster NOS on Tuesday, De Boer confirmed the approach, adding: "I'm going to listen and talk. Then I'll make my feelings known." In February, he told the BBC he had turned down the chance to speak to Tottenham after Villas-Boas was sacked. De Boer said he had also declined talks with Liverpool in the past but would be interested in managing either club in the future.